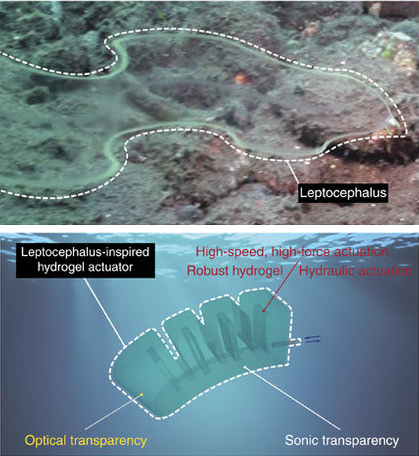 Today robots aren’t just becoming more like humans, they’re also mirroring sea creatures. 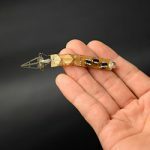 Developed by engineers at MIT, these soft camouflaging robots are inspired by leptocephali (transparent larvae of eels) and can perform a number of tasks, such as swimming, kicking rubber balls and catching and releasing a live fish in water. And what are they made of? They are made entirely of transparent hydrogels – hydrated polymeric materials that are composed mostly of water. A team led by Xuanhe Zhao, associate professor of mechanical engineering at MIT and Hyunwoo Yuk, a graduate student, have been developing recipes for hydrogels that are durable and flexible enough while being able to perform forceful tasks. 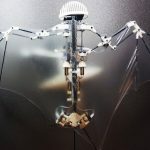 The team has developed different hydrogel robots that perform distinct functions – an appendage that curls up and down, a fin-like model that flaps back and forth, a hand-like gripper catches and releases effectively (Figure 2, 3 and 4). The robots were developed using hydraulic hydrogel actuators, instead of existing osmotic-driven hydrogel actuators. The latter are significantly limited by low actuation forces (e.g. millinewtons) and speeds (e.g. response time of minutes to hours) due to intrinsic coupling between the responsive time and the actuation force of the hydrogels. On the other hand, hydraulic-driven hydrogels with precisely designed structures allow the robots to function with much higher actuation force (e.g. over 1 N) and speed (e.g. response time = >1 s). 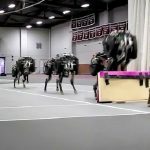 The robots are also capable of optically and sonically camouflage in water. 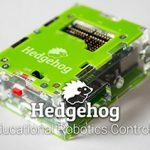 Each robot is composed of soft bending actuators. Measuring 25 x 150 x 15 mm in dimensions, a bending actuator consists of 7 unit-segment actuators serially connected together. Soft hydrogel parts feature hydraulic chambers and hydraulic connections. Stiff hydrogel parts are made of a less extensible element to enable the bending under hydraulic actuation. Compared to existing osmotic hydrogel actuators, this macro scale hydrogel actuator offers remarkably fast motion. It can perform a 20-degree bend in less than 1 second. Note: For optimal visual representation, the transparent hydrogel was dyed to pinkish red. To power the robot, water is pumped into the actuation chambers. In the video below, the originally straight hydrogel actuator bends into a full circle just under 1 second. The actuator restores its original shape when the water is pumped out in another 1 second. An osmotic hydrogel actuator made of the same hydrogel would take much longer (i.e. hours) to perform the same bending motion. 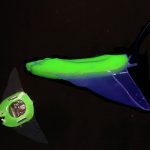 In their experiments, the team have fashioned a hydrogel robotic fish that can swim like a real fish and a hand-like hydrogel gripper that could grip and release when water is pumped in and out of the device. In the video below, the hydrogel robotic fish maintains the camouflaged state while swimming over a rainbow-colored background. The fish is also able to perform forward fishlike locomotion through hydraulic-driven agile tail actuation. Two separate hydraulic parts control the hydraulic actuation of the fish (Figure 3). The camouflaged hydrogel gripper below demonstrates its ability to flex fast enough to catch and release a live goldfish. Owing to its optical transparency, the hydrogel gripper maintains the camouflaged state as it approaches the proximity of the goldfish in the water tank. The hydrogel’s agile actuation allows successful gripping motion while its intrinsic softness enables release of the caught goldfish without any harm. For operation of the gripper, six bending actuators are actuated simultaneously by one hydraulic input (Figure 4). 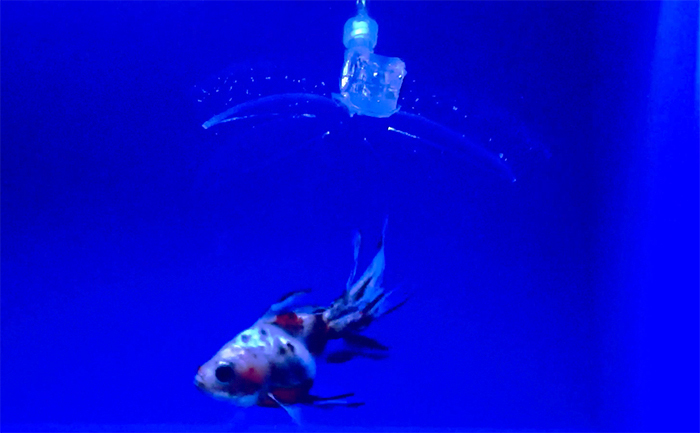 In the video below, the transparent hydrogel gripper catches and releases a live goldfish. The hydrogel structures are almost completely transparent and appear entirely camouflaged under water. They also have almost the same acoustic and optical properties as water. Typically, silicone elastomers like Ecoflex and Elastosil are used for soft actuators and robots. They are stretchable but are optically opaque with 5% transmittance in visible light range. PAAm-alginate hydrogel, on the other hand, has much higher transmittance rate of 95% in visual light range and reflective index (e.g. 1.3365) similar to that of water (e.g. 1.333). PAAm-alginate hydrogel also possesses remarkable sonic properties. The speed of sound inside the hydrogel structure (i.e. 1485.7 m s−1) is nearly identical to that of pure water (i.e. 1447.5 s−1). PAAm-alginate hydrogel’s acoustic impedance (z0=1.487 × 106 Pa s m−1) is only around 1% different from the acoustic impedance of pure water (z0=1.448 × 106 Pa s m−1). Optical light and reflective sonic waves are commonly used in sensing applications in underwater environments. Hydrogels have very similar optical and sonic properties with water, and this makes the hydraulic hydrogel actuators a perfect choice for camouflaging devices. 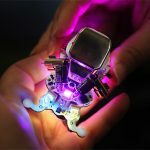 According to the researchers, these hydrogel-based actuators and robots offer practical applications in areas as diverse as biomedicine, tunable optics, soft electronics, and robotics. For example, the hydrogel devices can be further improved for therapeutic uses such as targeted drug delivery. The devices can also be used for real-time high-fidelity optical and ultrasound imaging, owing to hydrogels’ optical and sonic transparency.